Basundi: Basundi is sweetened dense milk made by boiling milk on low heat until the milk is reduced by half. Heavy cream may be added during the boiling process to hasten the thickening process. Once reduced, a little sugar, cardamom, Charoli and/or saffron are added. 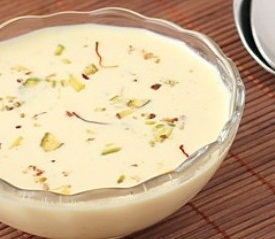 Basundi is very similar to the north Indian rabdi. Almonds and pistachios add crunch to this creamy sweet. Basundi is generally served with masala puri. Pour milk in a heavy based or non-stick deep pan. When milk starts to boil, reduce flame to low. Simmer the milk until reduced to half of its original quantity. Add in the green cardamom powder and sugar. Cook for 5 minutes over low flame, while stirring continuously. Transfer the basundi to a serving bowl. Garnish with almond and pistachio slivers and saffron strands. Serve it hot or cold according to your choice. Add 5-6 saffron (kesar) strands, before adding sugar, for nice colour and aromatic flavor. If you have any queries regarding the Basundi recipe, please leave a comment.